Midnight Tanka | Digitalestate Inc. Printed book (print on demand) version was released. You can buy printed books. “Midnight Tanka – Shaking Eggs -” is a book of tanka (Japanese poem of thirty‐one syllables) and two essays written for adults. The reason for putting the word “Midnight” in front of the book of the title is that adults completely forget their daily lives at midnight, and that they would be able to temporarily play in the world of words of nightly delusion. 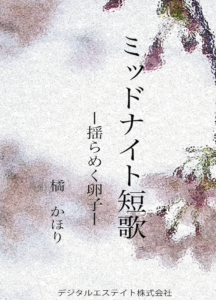 The content of the book is Midnight Tanka (Chapter 1), the first section “Season (when)” is pointing to the landscape in the flow of nature as it is surreptitiously reflected in his eyes. Section 2 “Miscellaneous” is Tanka that do not enter “season (time)” or “love”. The content of the third section “love”, because it is a world of delusions, I am writing not only from the standpoint of women but also from the position of men. And you can easily understand, since it is not only a relationship between opposite sexes, but also a few homosexual love affairs. This kind of midnight tanka end with this, followed by essays of chapter 2. Adults who can afford to enjoy freely everyday and different time freely in the world of delusional language will also be one that will enrich their lives. The world wider than the narrow world, the one whose consciousness has spread will be the usual everyday life will be easy to live. Isn’t it an affordable adult margin? In this world of midnight tanka sometimes fresh surprises to try and taste various emotions such as being thrilling, sometimes purely, sometimes cunningly, occasionally marveling, sometimes still seeing himself who does not yet see it Is not it a certain thing? After the trip alone to this delusing forest in the middle of the night, the next morning I woke up may be somewhere changed. Why don’t you take a strange charming journey that you have not had so far? Let me show you from now. Now, please …. Born in Nagoya city. When I was in high school, my eyes were opened to the world of Waka. I learned from the national literature of the university and I am interested in the natural manuscript of “Man’yōshū”. Later, interest shifts to Waka in the era of “Kokin Wakashū”. At one point, I started to write tanka but it will end in a couple of years. However, again, I began to write from the end of last year, but I do not belong to masters or groups. Please enjoy “Midnight Tanka” in preview. Click the icon below to jump to the site of the leader you clicked on.